When it comes to positioning your product, or your business; the only variable that drives consistent success is value. Picture for yourself a flea-market. Like the ones, you find in south-east Asia. Hopefully, you’ve had the good fortune of haggling yourself a good deal on some knock-off sneakers or a half-decent set of jeans. It’s always a confronting experience to exchange with a retailer in real-time how much you think a product is worth… And that’s the point… how much do you think a product is worth? With any conversation about value, there’s an exchange. 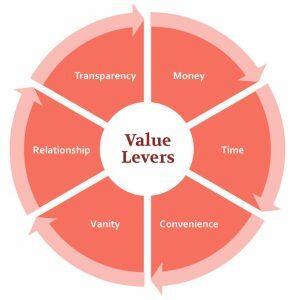 It doesn’t matter if we’re buying a pair of knock-off Nike’s or signing a deal with our biggest client yet, it’s a value exchange that involves one the six elements of the value wheel; Money, Time, Convenience, Vanity, Relationship and Transparency. Struggling to sell that product? Chances are one of these value levers aren’t working for you. Struggling to sign up a deal? Try pulling more than one of these levers at once. Still can’t win? Chances are someone’s tipping the scales better than you. One of those other levers just so happens to be the most precious resource in the world. Something we’ll never see or touch, but experience instead. Something that day-after-day slips through our fingers… and as our managers, executive and even the workforce, in general, get better and better at layering task work and mobilising their workspace, they’ll come increasingly time precious about the little time they have to themselves. Time is a value factor not just in saving it, but in giving it back. Time can come in the form of service to a manager who knows he won’t receive an after-hours call again. Time can come as a gift, a result of a system that works. And time can come in the form of focus. Time to look at the things that matter, knowing someone else is spending time on the things that are lower in value. Give time to a customer, and you’ll talk value beyond the features and benefits of a product or service. Bottled water is a stupid idea. Yet, I buy it. And so do most people I know. Why? Because it’s not just “a drink” it’s a portable drink. Available to me whenever I need it, at the moment I need it and most probably, cooled in a refrigerator. I don’t even plan to buy a bottle of water. But when I need it most, it’s nice to know the option is there. Convenience will make people buy for some of the wildest and most inexplicable reasons. It’s also the major driver of value for the time-poor. Convenience keeps customer coming back for more and creates value by removing friction and being proactive. It could be in the sales process, the delivery, the experience or even as an ancillary benefit. Convenience is a major value driver in digital through UX and can disrupt the expectations of the time-poor. Ever think about how luxury brands became “luxury”? Someone had to put a logo on a shirt and charge a stupid amount of money for it. The market establishes the value of the shirt and ascribes a luxury value to its wearer. Let me put it in B2B speak… A bank wants to develop a new strategy. They don’t want to get it wrong. Instead of putting their heads together, they buy a brand-name consultant to de-risk their leadership decision. Should they be quizzed on why the strategy failed, they’d simply say: “We consulted with the best”. That answer may not be true, but the vanity of it is. Vanity sells. Whether you’re a consultant or a Kardashian. Packaging your product or service to appeal to brand alone is the challenge. Get it right, and it’s a profoundly powerful value lever. But what about those deals are done “in-kind” or via “goodwill”. Where a contract is won because someone knows someone, or is looking after them somehow. Just like everything else, it’s a value exchange. A relationship is simply trading on intangibles: friendship, camaraderie, duty, leverage or event political gain. Whatever it is, even if it’s a deal done with a relationship, value is exchanged; regardless. Relationships create powerful value levers. They’re delicate, require constant management and a keen sense of self. But the captains of industry always seem to know how to pull this lever first. The last lever is a new one in the marketplace. Something the old-guard aren’t used to, and yet simultaneously the new leaders expect. Transparency demands real-time access, humility, honesty and a boldness to be seen for who you really are, or who your company really is. Transparency will continue to grow as digital platforms develop, real-time dashboards become the norm and management expectations move to an “always-on” approach to projects that are increasingly agile. Being transparent creates value by backing yourself from the start. It shows your customer you’re genuine in your intent and open to feedback – something that could quickly de-risk one vendor vs another. Is it worth the money? Well, is it? Does it achieve an NPV? Does your customer need you/it/more? Are you sure? Money can be a fantastic leveller when it comes to the value exchange, and at its finest, in the right hands, it works hand-in-hand with the other levers to deliver significant value, every time. Money exchange is something we’re all familiar with. We all use it to buy cars, groceries, holidays, etc. But it’s not the only exchange at play when it comes to business success. Think about the disruption of Airbnb or Uber at the moment, early 2018. The hotel industry is upset because they missed out on their annual premium rates during the Australian Open… because AirBnB provided too much competition. In a position to provide frightening levels of value and tip the scales toward the customer with money AND time AND convenience AND vanity AND relationships AND transparency is a win for consumers and an emerging economy that’s redefining the “value exchange” of holiday accommodation. It’s simply up to the incumbents to keep up. When it comes to crafting your value proposition or packaging your product, think about a set of scales… an old one, where you weighed one thing against another. And let that image of balance describe your value – the tip it; toward your customer. If you provide the product or service, then you should start your discussions at 51% value. Why? Because when the focus is 51% rule, we ensure the perception of any “value exchange” falls to favour the customer. And it ensures that whether it’s money, time, convenience, vanity, relationship or transparency the buyer believes they’re getting “value for their money”. So how do we create significant value? By valuing commercials, valuing time and valuing convenience. By understanding the brand, valuing the vanity and tipping the value in customers direction; 51% or more. And the metrics for success are wildly simple; success. Are you successful in delivering value? Well did you achieve your goal? Close the deal? Win the stakeholder? Sell the product? Disrupt the market? Success in a digital marketplace is like the wild wild west… It’s unruly, undisciplined and fast moving. But it’s also a strict meritocracy and a free market economy. The reason we’re seeing tech companies battle incumbents with decades (if not centuries) of prior experience, and win, is that they’re tipping the value toward the customer and providing a better value exchange, over and over again.